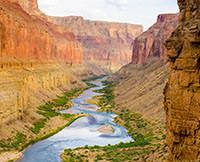 A beautiful way to see the Grand Canyon! We had a great trip. The 28 guests and 4 guides, Evan, Ben, Matt and Sam made the trip. We couldn't have asked for better guides on the river and off. We took our younger daughter, and Matt and Sam were always watching out for her through the rapids and on the hikes. The rapids and watching the stars as we went to bed were a couple of the highlights.